Ancona - Ventimiglia. Somewhat of 1300km.. the first kilometers of the Pin Project.. the first pins.. the first thoughts.. the first feelings.. the first pictures .. our first story ..
As already known, Sunday afternoon of 29th, was the scheduled departure from the port of Patras. 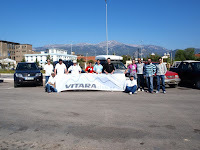 The Vitara Club had organized a fiesta for us.. the last goodbye within the Greek territory. Mixed feelings.. what prevailed was.. basically we did not know how to feel.. it is what we were tired of saying that we had not realized what we're going to do. With 3 hours delay, we arrived on Monday afternoon in Ancona Port and very quickly we run our first kilometers in Italy towards Perugia. We camped at an incredible camping (Il Rocollo) and this is how our first day closed. Don’t believe what they say. Go see. This is our motto and the same is for Tuscany. Perugia, Siena, Chianti, Florence, Pisa.. Wonderful medieval towns full of life, full of history, full of images.. We spent two rainy days during the day and wet during the night but we had a great time.. The camping in Siena (Le Colleverde) was expensive and quite unexciting. But staying at Villa Camerata (Hostel & Camping) in Florence was a different experience. It was a huge camping and relatively empty so we settled down quite easily. The main building was also in medieval style with a scary lighting on the top. Georgia felt quite frightened while the people in the reception were a bit intimidating. Nevermind.. all went pretty well and we enjoyed Florence a lot. After spending two days in the capital of Tuscany we decided to move northeast to Reggio Emilia with a quick stop at the famous leaning tower of Pisa. Eventually, it leans much than you think and it makes you wonder if they did it on purpose or by mistake! 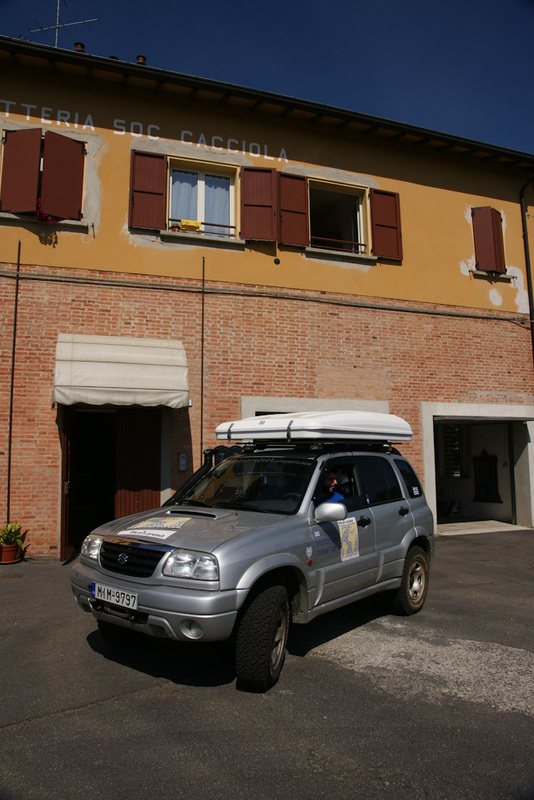 In a small green village, Cacciola, near Reggio outside of Parma, we had an appointment with two travelers.. Without knowing them or even met them before, Akis Temperidis and Voula Netou waiting for us in their new place. 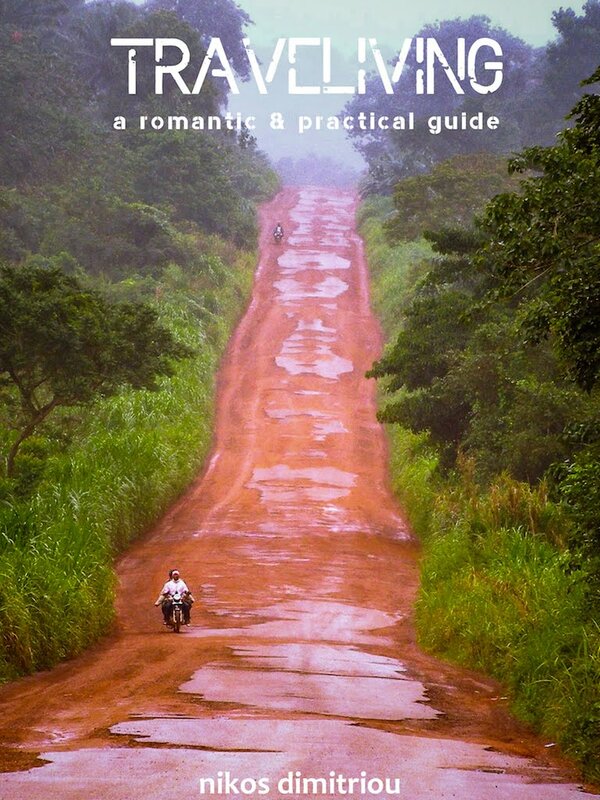 Well known as TheWorldOffRoad (from their trip around the world), they set a benchmark for the Greek overlanding chronicles and are also a source of inspiration for us. We had studied their long trip and we were very curious to meet them. Awe and respect. It is what we thought about them. Respect because they are two ordinary people with too simple way of thinking. Awe because their experiences, their media collection and their stories are not only impressive but also set the standards for an undemanding way of living. Along with Mr. John and Mrs. Soula (Voula’s parents), they offered us genuine north-greek hospitality. At the end, they wished us the very best for our trip and in some way they felt that they started again for their tour around the world. For all of these, we would like to deeply thank them! After the four-day stay in Cacciola, we decided to pop in Maranello, the birthplace of Ferrari. Bored of counting Ferraris.. red, black, yellow, new, old. The Maranello museum of the Italian brand presents the history of the empire of Enzo Ferrari. Both the F1 and the purely commercial state-of-the-art pieces of Scuderia are unveiled at the old museum in Maranello (the new museum is located in Modena, but we decided to visit the old one). Moving to northern Italy, we had another appointment with a former Italian colleague from my last job. Fabio with his wife Valentina and their baby Leonardo were waiting for us. They had prepared a luxurious table with authentic Italian flavors. In Mulazzano, a village outside Milan, we stayed for one night where Fabio as a real Sicilian offered us a true Mediterranean hospitality. We tried everything. Boukatini amatritsiana, prosciutto and a variety of Italian countryside hams, parmiggiano and homemade limoncello from Sicily. Greeks and Italians are the same people. From a social and political point of view, we have exactly the same ideas, the same problems and the same reactions. The next day we headed to France, crossing the Ventimiglia - Menton borders. We liked: Lambrusco (traditional red sparkling wine) from Reggio Emilia, the green Italian province full of vineyards and local wineries, green within urban areas. We disliked: Tolls (about 1 euro/km), the overall commercialization of all the famous Italian sights. We saw: Bike lanes everywhere, colored prostitutes across the Supestrada from Siena to Florence. Driving in Italy: The roads are really very good either you get the international highway known as Autostrade or follow the provincial network known as Superstrada. Italians, despite their tradition in the automotive and racing, they just do not know how to drive. They ignore any concept of side lights and do not respect the priority in highway exits. The general sense is negative. We did not run at high speeds as we mainly used the provincial network. Generally the average speed did not exceed 50 km/h. Wonderful routes: SR222 from Siena to Florence through Chianti, A15 (Autostrade) from La Spezia to Parma and SS35 from Pavia to Genoa. Average price for diesel €1.68. Most stations are 24/7 and you fill up by yourself. Vehicle: Zikos did it well so far but all in all, you do not need a four-wheel car to cross Italy. The car was weighed 2.270 kg at the port of Patras (with the auxiliary fuel tank being empty). The average fuel consumption is approximately 9.8 lt/100km driving only in tarmac roads on an average speed of about 45-50 km / h.